RetroShare provides filesharing, chat, messages, forums and channels. Portable but not stealth. Using limited accounts the usual QT junk. Using admin accounts three empty keys more: HKEY_CLASSES_ROOT\retroshare, HKEY_LOCAL_MACHINE\SOFTWARE\Wow6432Node\Classes\retroshare and HKEY_CLASSES_ROOT\Wow6432Node\retroshare. Can someone with two machines available test this program in more detail? Thanks for testing. Been wanting to try this out since I read the slashdot article. I was a WASTE user back in the day and pleased to see Retroshare kept going after I initially looked at it. There's even a Mac client. 1. I didn't exactly know what categories to include it in. 2. The licensing is a little confusing; I chose OpenSource. Thanks for adding RetroShare, joby_toss! Voted. /Frequently_Asked_Questions#Is_RetroShare_Open_source.3F]The licensing[/url] is a little confusing; I chose OpenSource. Great add, thanks. I modified the entry a little and pointed to the link you provided for the license. But surely the initial handshake has to go through the RetroShare servers? Or could someone point me to some documentation so I can get my head around how this works technically. - RetroShare 0.6.0 comes in two flavours- Qt 4 and Qt 5. - RetroShare 0.6.0 doesn't seem to be compatible with RetroShare 0.5.5c- it doesn't detect my settings, so I switched back to 0.5.5c. And a minor thing- I find the new icon very ugly compared to the nice previous one. Thanks to billon for cleaning up a bunch of errors I made on the recent update. I was trying to rush that and a bunch of other work on the site. Is there a reason to choose one over the other (i.e. which is best?). Should we add a note to the entry? In fact I haven't tried the latest version of RetroShare (0.6.0)- after I saw my settings were not detected I just deleted it and restored version 0.5.5c. I need to test it again and try to investigate the problem further (perhaps reading some documentation and searching the forum). My impression from other programs is that these built with Qt4 are lighter than those built with Qt5. 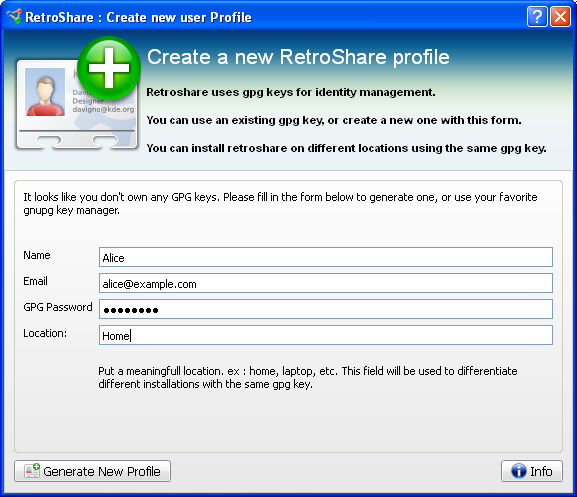 RetroShare is a program with unique features (it is a pity it is not popular, it is hard to test it alone). There are some programs with similar features (ANts P2P, Hybrid Share, Kommute, Muwire, Nodezilla, OFF System, OnionShare, Ring Community) but they are either abandoned or don't work any more or both, which makes RetroShare even more valuable. RetroShare is far easier to configure than GoldBug for example. - The automatic 'checking' text has disappeared from the statusbar on startup. Bug ?